Update 2: In a major win for May, the Commons has voted 317-301 in favor of the Brady amendment seeking to remove the most controversial part of the Brexit deal with the EU: The infamous 'Irish Backstop.' The amendment calls for replacing the backstop with a TBD alternative arrangement. May now has the mandate from Parliament she's been seeking to try and convince the EU to reopen the Withdrawal Agreement. However, according to Capital Economics, while the win for Graham Brady's amendment is "a good result for Theresa May," it's not a great outcome for the pound because, according to CE analysts, it increases the chances of a 'no deal' exit. The EU has repeatedly said it will under no circumstances reopen negotiations, per the FT.
"Should there be a U.K. reasoned request for an extension, the EU-27 would stand ready to consider it and decide by unanimity. The EU-27 will adopt this decision, taking into account the reasons for and duration of a possible extension, as well as the need to ensure the functioning of the EU institutions," Tusk said. "We welcome and share the UK Parliament’s ambition to avoid a no-deal scenario." But will they finally bite the bullet and accept that the only feasible option for avoiding 'no deal' is reopening the withdrawal agreement? Update: The Spelman amendment has been accepted 318-310 - an eight vote margin. The amendment (which is non-binding) calls for adding language to the end of May's withdrawal agreement stating that Parliament rejects leaving the EU without a withdrawal deal in place. We're now waiting for one last vote - on the government-backed Brady amendment. That will be an important vote, given reports that members of the ERG have reluctantly agreed to back the amendment. 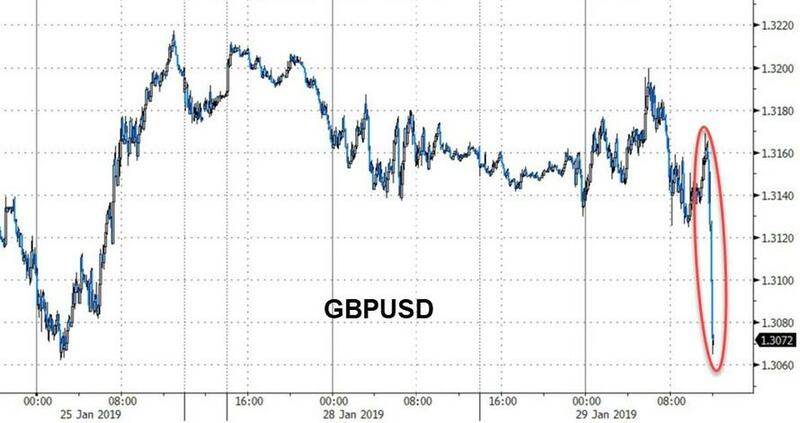 The pound sunk Tuesday afternoon as MPs voted down two amendments, proposed by Labour MPs Yvette Cooper and Rachel Reeves, respectively, to raise the possibility of delaying Brexit. The Cooper amendment was one of a series of amendments that had been voted down on Tuesday. Some 139 lawmakers had put their names to the amendment, including 11 Tories, prompting speculation that the amendment would have a chance of passing. Reeves' amendment would have called for a delay of Brexit Day if no deal had been passed by Feb. 26. Here's a rundown of the seven amendments being voted on Tuesday, and the results so far. And it's worth remembering that this might not be the end of the Cooper amendment. Conservative backers have said that if the amendment fails, they might try again. Worth remembering it's not the end for the Cooper amendment. Expect it to be brought back to the Commons in two weeks time ahead of the meaningful vote. Labour had been pinning its hopes of defying May on these amendments, and as BBG noted, there are "a lot of glum faces" in the Labour benches.